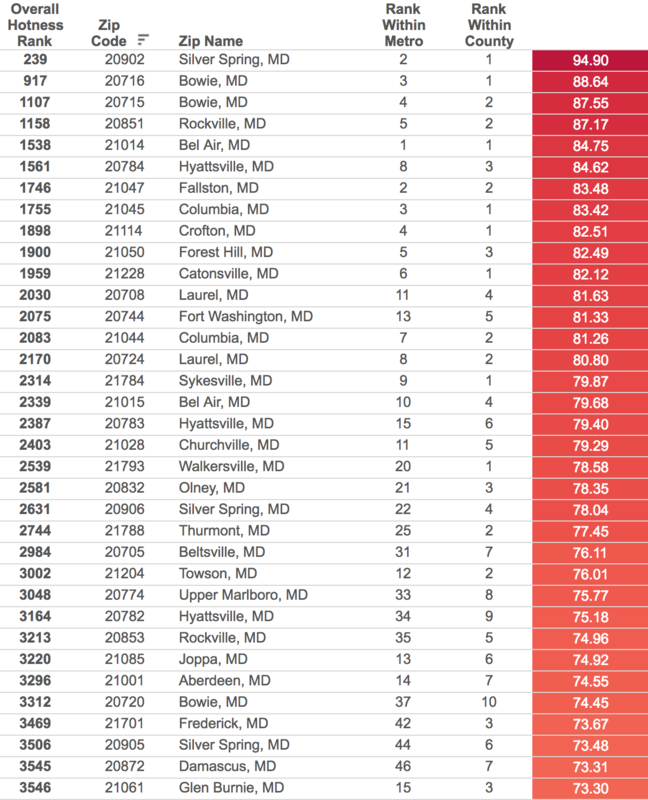 The latest report on our region’s “Market Hotness Index” shows high demand for the inner suburbs of the Baltimore-Washington corridor, including Catonsville, Silver Spring, Ellicott City, and Towson. These cities have stable populations, good schools, community amenities, and close proximity to jobs; they continue to attract younger families and first-time homebuyers while retaining older retirees who favor the benefits of community and access to services. Farther out in the suburbs, towns with an established “Main Street” or downtown district — such as Columbia, Bowie, Bel Air, Sykesville, and Crofton — provide the convenience and community of a city while allowing residents to have more open space and privacy than a traditional urban environment. These locations, along with dense inner suburbs, seem to be attracting attention for their mixed-use atmosphere and variety of home styles other than single family. Places like Laurel have thrived, attracting professionals and families who enjoy the ease of travel between the two anchor cities of Baltimore and DC, easy access to jobs, and a revitalized downtown area with many activities on offer. You will see towns like Laurel, Bowie, and Columbia continue to attract residents as they move toward more urban layouts and development. Overall, Baltimore-Washington Metro continues to exhibit reliable growth and attract investment from business and government alike, which fuels its rise in both population and home values. This growth seems specific to areas that are more suited for growth than others. With so much activity between these two global cities, central Maryland is simmering on the “hotness” scale.